"Very friendly and professional staff. The atmosphere was very inclusive and welcoming." "Awesome staff and the Doctors are the best. 5 stars!!" "I can't thank Dr. Bogorad, Dr. Sponseller and the entire staff at Eye Care One enough!" "I brought my 9 & 13 yr. olds and they were treated with such genuine care." "Great customer service. And waiting time is less than 5 minutes." "Very professional staff and we loved our doctor!" 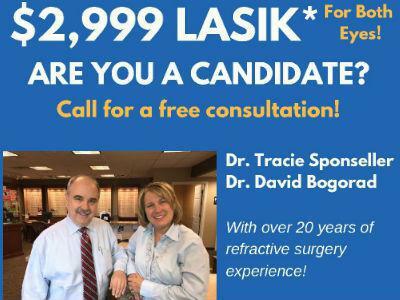 "LASIK done here in 2012 and still perfect results!" "I have seen these doctors for the last four years. The doctors are wonderful." "Dr. Tracie Sponseller and staff is a class act!" Special offer until the end of the year. Call us at 706-651-1291 to learn about this great promotion!